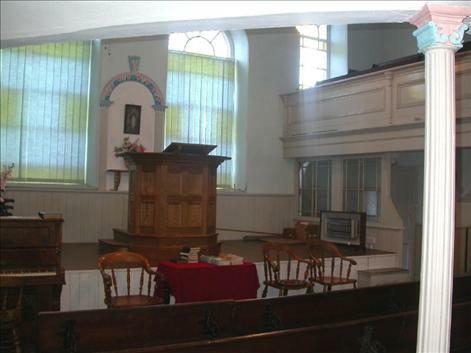 Pray with us Wednesday at historic Moriah Chapel! This is a reminder and an invitation to join us this Wednesday, October 31st at 6:45 p.m., for an international prayer service in the schoolroom at Moriah Chapel in Loughor. This marks 108th anniversary of the beginning of the 1904 Welsh Revival that changed the face of Christianity. Please plan to arrive no later than 6:45 p.m. so as to have time to get situated inside. There will be a live video link with a group of intercessors praying with us near Sacramento, California from 7:00 - 9:00 p.m. If you live near the Sacramento area in California, you can join them in prayer on the 31st from 12PM to 2PM at the Rock of Roseville Bonita Campus, 202 Bonita St., Roseville, 95678. There is more information at the "Rock Home" link at the top of the page below. If you plan to be with us here in Wales, please let us know so we can get an idea of how many people will be coming. We anticipate a unique time of prayer together. This will be the first time there has ever been a worldwide video broadcast of trans-Atlantic prayer from historic Moriah Chapel in Wales. We sincerely hope you will join with us in our plea for heaven-sent revival for the nations! We had a very special blessing on Thursday at noon when we picked up our youngest son Dicky for a visit. He is in Munich for six months with his job, which makes a short trip more practical than from California. Friday was a beautiful clear day and a casual visit to nearby Cwm yr Eglwys (Valley of the Church) turned into a little adventure. 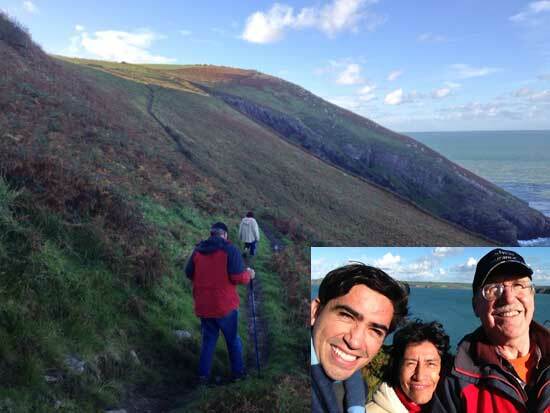 Lured on by the coastal pathway, we hiked three miles around Dinas Head. We were looking forward to getting back into the sunshine. 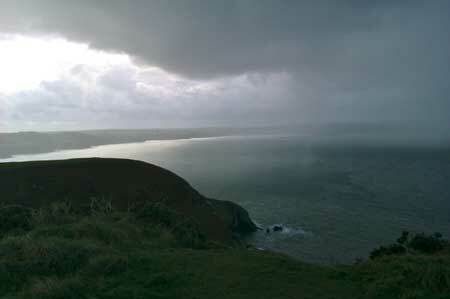 But by the time we made it around to the highest point, we were greeted by dark clouds and almost immediately engulfed in a brief but torrential hailstorm in all its awesomeness! It was a rare good time and we could only laugh at such a quick change of events. Thankfully we had adequate clothing, and after cutting through the fields of a large sheep farm rather the following the muddy and slippery trail, a warm pub with hot drinks on the other side was a welcome find! When we set out to follow the Lord, we never get to see very far ahead. Dips and corners in the path that He sets before each of us can hold all kinds of surprises. Some of them can be wonderful and glorious, and others can be very much the opposite. But we know that throughout the entire journey, He is with us and will never let us go. We took part with a small group there in a dedicated prayer room. We prayed for the activities during the day and for people who came in for prayer as well. It was a wonderful time, and a real blessing for all involved. 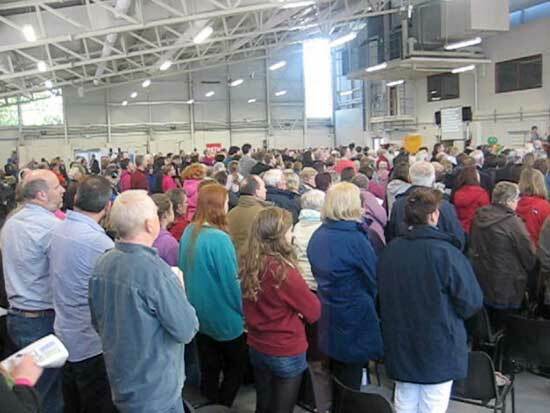 I am guessing that is was one of the largest events of its kind in recent history, and surely a real encouragement for the nearly one thousand people that attended. It is all too easy to be so focused on our particular corner that we aren't aware of all that God is doing in so many lives and places! We are so thankful to the Lord for this adventure He has given us as we continue to pray for and trust Him for the coming revival in Wales! We will be meeting for a joint prayer service in the school room at Moriah Chapel in Loughor on October 31st. Please plan to arrive by 6:45 p.m. so as to have time to get situated inside..There will be a live video link with a group of intercessors praying with us near Sacramento, California from 7:00 - 9:00 p.m.
We are really looking forward to the experience of joining in live prayer together with brothers and sisters from 1/3 way around the globe, all of whom have a heart for Jesus and for Revival! If you would like to take part in this in Wales, please let us know so we can get an idea of how many people will be coming. If you are near the Sacramento area and would like to join with us, you can find the information you need at the Rock Home link at the top of the page below. We are looking forward to a powerful time of prayer together and hope you can join us! Eyes glad to report about Gladys and I! "For You formed my inward parts; You covered me in my mother’s womb. I will praise You, for I am fearfully and wonderfully made; Marvelous are Your works, And that my soul knows very well." Well, my soul is still learning! I was amazed to discover the ingenuity of the structure of eyes. Just look at that uppermost muscle. Its tendon actually goes through a little cartilage "pulley" in order to rotate our eyeballs and keep them vertical when we tilt our head. Exactly how and when did that get threaded through there? "Wonderfully made" indeed! Several of you have asked how I am getting along with this double vision, and also about Gladys and her long term stomach problem. And we both want to say a big "Thank you" for your concern and especially for your prayers! My good news came this morning that a CT scan of my head showed everything is normal. We praise the Lord for that, as there were a few scary possibilities of something pressing on my optic nerve or eyeball. They didn't even find any loose screws as some of my friends have suspected for years! I continue, however, with the double vision for the time being. The ophthalmologist says that in over 50% of such cases the problem just disappears after a few months. They don't really understand what brings it on or why it goes away again. Please continue praying that it does go away soon. 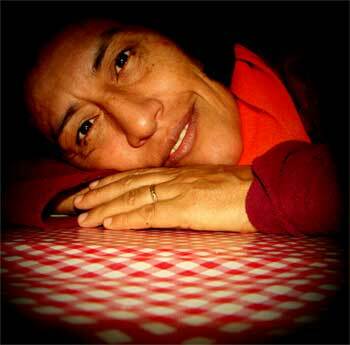 In late June Gladys was re-tested for the h.pylori infection which she'd been treated for a third time last spring. And praise the Lord; it is no longer there! However after nearly two months of being much better, she began to have similar difficulties again. We saw the specialist again a few weeks ago, and he started her on a very high concentration of probiotic bacteria. She has felt some relief with this, but still experiences stomach pain with many foods and has had to limit her diet quite strictly once again. So your continued prayers for her would be very much appreciated also! We know with Whom our trust lies, and He is faithful to see us through and bring us ever closer to Himself in the process. Massive UK Prayer Day & Trans-Atlantic Revival Cry! The past few days have seen some tremendous prayer from both sides of the Atlantic. 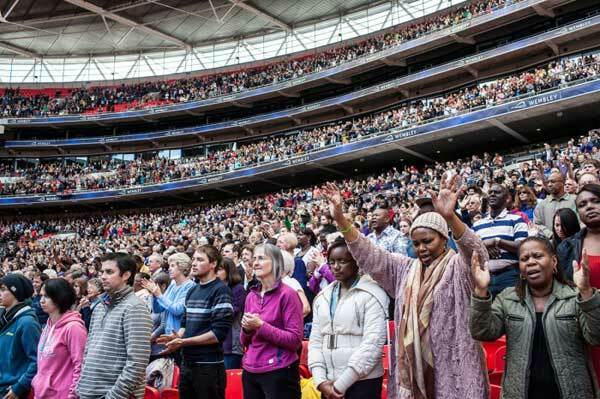 In London on Saturday there was a convocation of over 32,000 Christians together at Wembley Stadium. There are more pictures on the National Day of Prayer web site. I heard reports yesterday from friends who attended the event that it was immensely powerful and heart rending as cries went heavenward for the mercy of God to be released on this nation and for a restoration of Godly principles of government. One friend said, "Seeing so many Christians together was awesome. The times of music and worship were wonderful indeed, but the prayer..." She paused and both of our eyes filled with tears. "We prayed for all the countries, the government and the royal family. But what most impacted me were the prayers of repentence. Near the beginning there was a serious time of repentance for all that was wrong in our lives, in society, etc. Everyone praying together with one accord was just very, very moving." Another said, "I Thank the Lord for the privilege of attending the National Day of Prayer on Saturday 29 September at Wembley. It was so good that nine of us went from Cardigan. I thank the Lord for the opportunity to Praise & Pray with so many Christians, especially praying for our Nation. I was touched by the need to pray for the Children in our Nation." 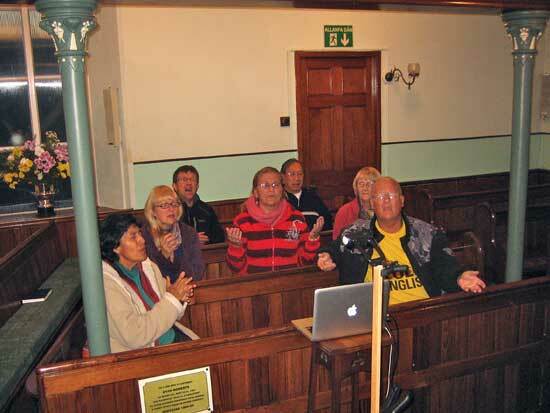 On the local front that same evening, we joined with a few friends in an unusual trans-Atlantic prayer meeting at nearby Blaenannerch Chapel. We were linked together via internet video with a 12-hour Citywide Sacred Assembly that was taking place in Sacramento, California. Our friend Francis Anfuso with leaders and members of many churches met together to cry out to the Lord with fasting and prayer for their city, their state, and the nations. A one hour segment was dedicated to prayer for Wales! On this very day, September 29th in 1904, from the seat shown here a young Evan Roberts cried out, "Bend me, Oh Lord!" It was then and there that he received the Power of God, and from there became His yielded vessel for the releasing of the Welsh Revival. Two years later, as a result of what happened here, it was at Azusa Street in Los Angeles where the Fire of God broke out again. That was our very prayer and cry also. 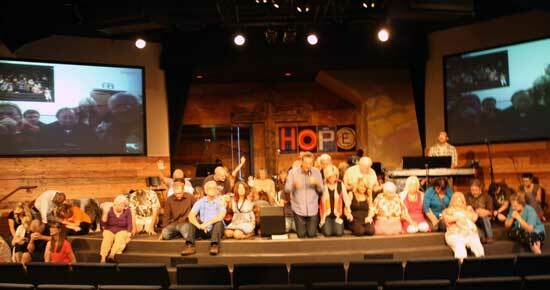 After a time of worship, we took turns praying - one in California and one in Wales, all in plain view of one another. With the very first prayer I found my undone by the Holy Spirit with a deep longing for His outpouring in our lands. At the first prayer from our side, Francis told the response there was practically the same. It was an extraordinarily powerful time of intercessory prayer. 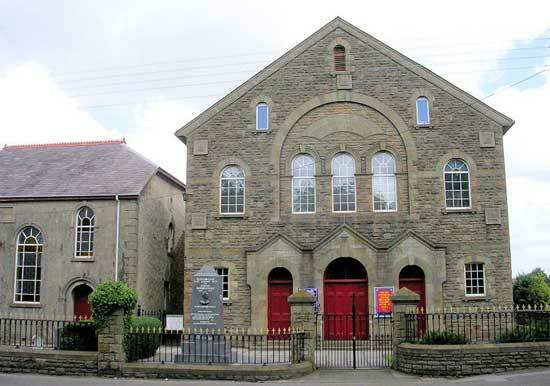 October 31st we are planning to have another such meeting at Moriah Chapel's vestry in Loughor, South Wales. This will the same day and the in very same room where the Welsh Revival was set alight. That first prayer meeting 108 years ago saw sixteen people converted and publicly confess Christ as savior. Within one week there were hundreds, and the news and effects of this amazing outpouring were spreading apace throughout Wales and beyond. We will be linked by video conference for two hours with a larger group from from Sacramento, and possibly others elsewhere also. If you would like to be involved in this unprecendented event, please let us know and we will provide more specific details as to times, etc. Moriah Chapel vestry is not that large a place, but an overflow of people would be a welcomed similarity to those earlier days in 1904!